Two stories about birds. One silly, one sad. 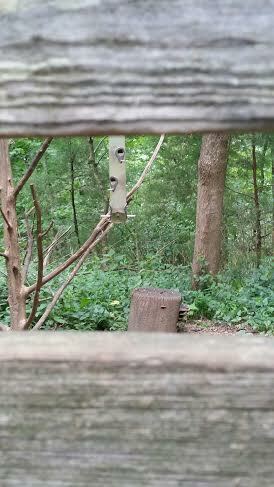 Last weekend, I went on a walk around a Nature Center at a local park. It features a "bird blind". So I had a little giggle thinking that there is probably some bird perv out there peeking through the wall and jerking off while watching chickadees. Leave it to me to take something wholesome and go blue. It's what I do. And that's the happy story. The sad one is that my dog is a killer. Last night, I let Piper out the back door - it was about 10PM, and dark. She went off to the side, and I heard a squeak, and she came running around the side of the yard with something in her mouth. The something was a cardinal fledgling. I jerked her into the house, where she was frenzied. I calmed her down and went out to dispose of the remains. I felt terrible, as you will. I brought her back out to do her business, and she basically sniffed around looking for prey. But she's a dog. She didn't do it to be evil. This is the face of a killer. Guilty!